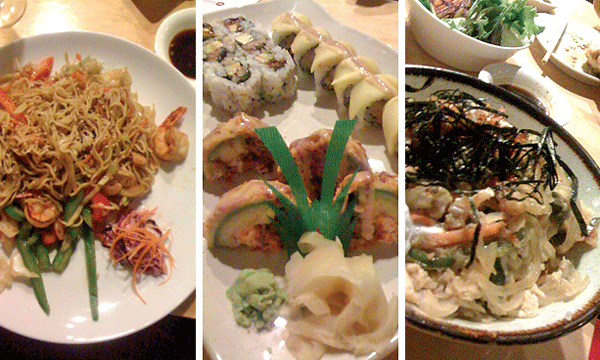 North Shore Dish » Blog Archive » Are We Crazy to Try Sushi on Route 1? Are We Crazy to Try Sushi on Route 1? Fuji Sushi, located in a small strip mall on Route 1, does not look impressive from the outside. But we had heard good things, and their website proclaims they serve the best sushi on the North Shore, so we headed in to see for ourselves. Ironically, it was the sushi that disappointed. There is a large selection of cooked and special maki rolls, and we sampled two that were quite good. The money brain roll featured spicy tuna and avocado and was deep fried ($8.25); the mango salsa shrimp roll was a great, fresh-tasting combination, with wafer thin slices of mango curved around the outside ($9.95). But the two traditional items we ordered from the sushi bar were very poor quality. The tuna sushi (two pieces for $5.25) was almost inedible, with large veins of sinew running though it, and the eel avocado roll was far too mushy ($5.25). If you are looking for inexpensive Japanese food and prefer “crazy” maki rolls over traditional sushi, you can do well at Fuji. Other sushi lovers will want to look elsewhere. I surprise how much attempt you place to make such a fantastic informative site. a visit the website, that’s whaqt this web site is providing. at this article reminds me of my previous roommate! He always keplt preaching about this. I most certainly wilkl send this information to him. Fairdly certain he’ll have a great read. Thanks for sharing!